Follow the directions to ‘Get’ or ‘Open’ the app. The orange Eventium icon will appear on your device’s screen. You may need to swipe left/ right to locate it. 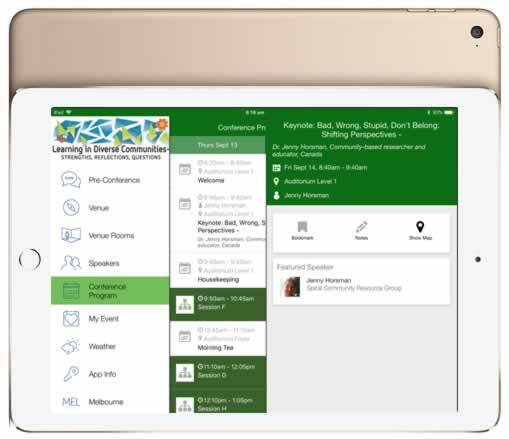 Tap and the Conference home page will open. The cog wheel above the menu, top right, allows you to refresh content. It is recommended that you take time to read, ‘App Info’. This will explain each icon’s use. Your Conference sessions will be printed on your name tag and were on the invoice sent when you registered, you can enter them now. Follow the guide under App Info. You will be using your device a lot each day and may use up the battery before you use up the Conference! Don’t have a tablet or smartphone? You’ll still be able to see all the information on the website and there’ll be a very simple print version at the registration desk.